This year’s Spring Garden Cleanup is ever more special as we will be preparing the grounds for Japan Festival’s 25th Anniversary Celebration. Join the efforts to ensure the Japanese Garden looks its best! Join the Houston Taipei Society for a day of fun gardening at Hermann Park and the Houston Taipei Friendship Pavilion. Family, friends and anyone interested is welcome! Lunch: picnic style lunch, bring your own, on-site food trucks are available or you can pre-order from the Pinewood Cafe. To pre-order at the Pinewood Cafe, click here. This year’s fall concert is scheduled for Saturday, November 17, 2018. The first kick-off meeting is planned for April 10th from 4:30 to 5:30 pm at Sunbelt Medical Corporation, 2040 Johanna Drive, Houston TX 77055. His Excellency Anatoly Ivanovich Antonov was born on May 15, 1955, in Omsk, a city in southwestern Siberia. He earned a B.A. and an M.A. in International Relations at the Moscow State Institute of International Relations in 1978 and 1983, respectively. 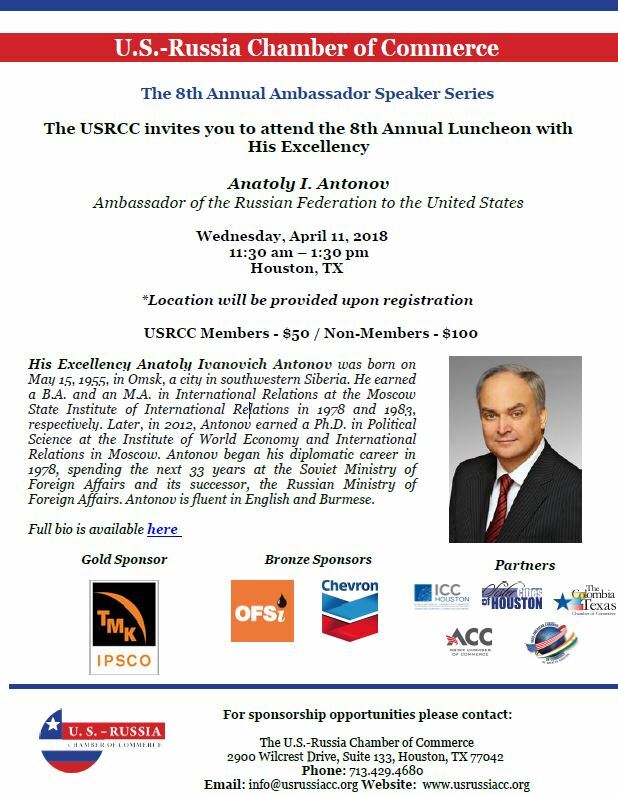 Later, in 2012, Antonov earned a Ph.D. in Political Science at the Institute of World Economy and International Relations in Moscow. Antonov began his diplomatic career in 1978, spending the next 33 years at the Soviet Ministry of Foreign Affairs and its successor, the Russian Ministry of Foreign Affairs. Antonov is fluent in English and Burmese. Join us at Miller Outdoor Theatre to celebrate 25 years of Japan Festival and 50 years of Japan-America friendship in Houston with a striking performance by Japanese drum troupe ASKA-GUMI! Once a year, the azumaya in the Japanese Garden is opened to the public for a traditional Japanese tea ceremony experience. Enjoy the ceremonial preparation and presentation of matcha, powdered green tea, and Japanese sweets. A limited number of seats are available per time slot. Save the date for JAPAN FESTIVAL 2018! Houston’s much beloved JAPAN FESTIVAL returns to Hermann Park for a special anniversary celebration. As we mark 25 YEARS, the festival promises family-friendly fun with authentic food, entertainment, arts and crafts, exhibits and demonstrations. 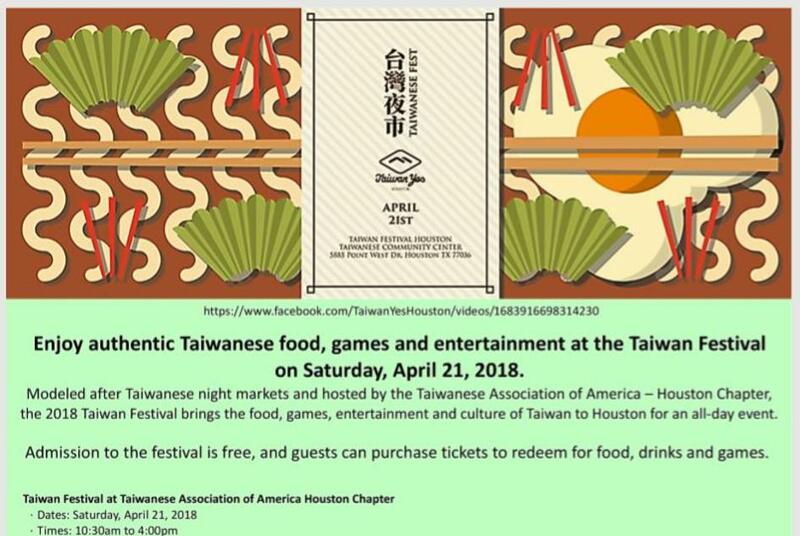 Come join the members of the Houston-Taipei Society as we attend the Taiwan Yes! Night Market experience. The annual “night market” event features entertainment, food, culture, exhibits on Taiwanese events and brings the night market experience to Houston. Admission is free, food, games and other activities require tickets. Career Day on April 27 with the German Institute for the Southwest. The German Institute for the Southwest is organizing a career day for high school and university students on April 27, 2018, in the building of the German Consulate General. If you know of a student studying German or of a teacher whose German class is not yet planning on attending, or an employer who would like to participate as an exhibitor, please write to angelika@germaninstitute.org. 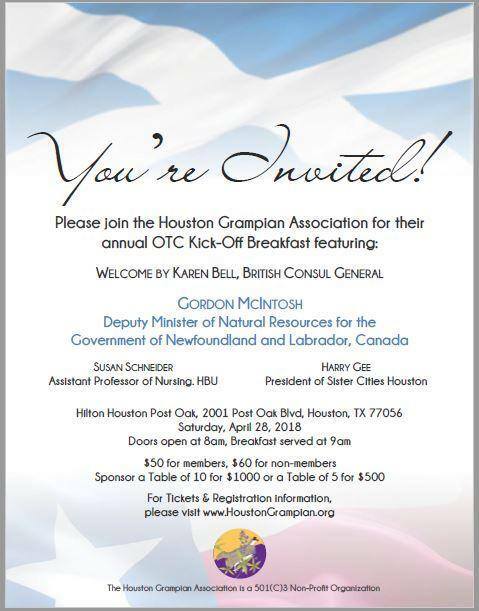 The Houston Grampian Association will host a breakfast to celebrate the 50th Anniversary year of the OTC. This breakfast is one of the opening events of the OTC week. The breakfast will be held on Saturday, April 28, 2018 (8am – 9 am Coffee & Social Networking & at 9 am Breakfast will be served) at The Hilton Post Oak, 2001 Post Oak Blvd, Houston, TX 77056. Tables of 10 Sponsorship is $1000, Tables of 5 Sponsorship is $500, Individual seats are $60 for non members and $50 for members. Gordon McIntosh – and he will talk about the ever changing Oil & Gas Market across the World. He is the current Deputy Minister of Natural Resources for the Government of Newfoundland and Labrador, Canada. He was previously Director of Aberdeen City Council from 1995 until retirement in August of 2016 (in Enterprise, Planning and Infrastructure), Past Vice Chairman Grampian Houston Association, Burgess of the City of Aberdeen, Past Director of Aberdeen Exhibition and Conference Center, Visiting Professor – Robert Gordon University Director AREG (Aberdeen Renewable Energy Group), Director Petroleum Research Newfoundland and Labrador. Susan Schneider of Houston Baptist University will speak about the yearly Nurse Exchange Program with Houston Baptist and Aberdeen Robert Gordon’s Universities which was founded in 1982. 2017 and 2018 exchange nurses will be in attendance. McCallum is the whisky sponsor. Money raised will benefit the yearly Nurse Exchange Program, they are a 501(C)3 charity. 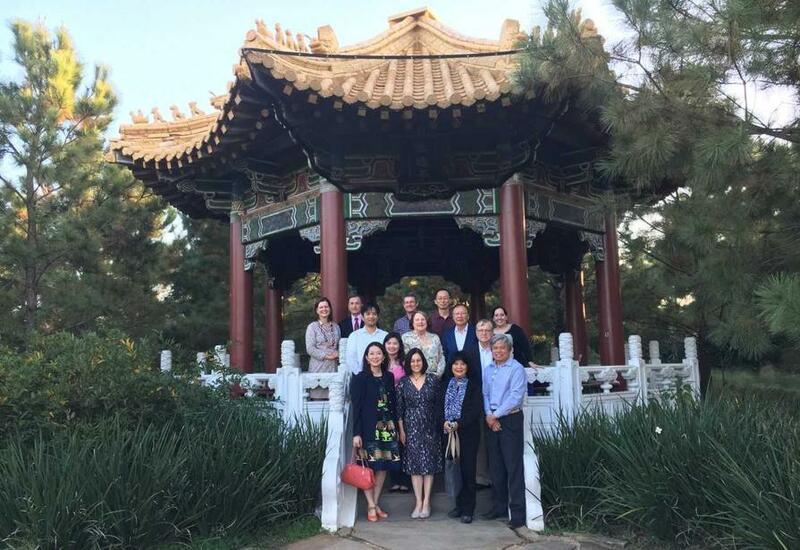 Come join the Houston-Taipei Society as the HTS hosts Dr. John Liang, President of the American College of Acupuncture and Oriental Medicine, as he gives our organization a unique presentation on acupuncture and the practice of Chinese medicine. On April 30, 2018, HLCSA hosted a welcome reception for the Angolan delegation to OTC at the Hess Club.